If you're buying all of your screw tip assemblies from the O.E.M., you're paying too much! 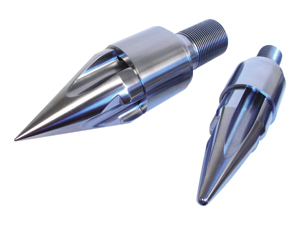 Services for Plastics, Inc. screw tip assemblies are made from significantly higher quality tool steels than available through the O.E.M. Along with better quality, SFP provides customized designing of the screw tip assembly to successfully work with your brand of molding machine and type of application. And SFP offers them at significantly lower prices than the O.E.M. can offer. SFP screw tip assemblies are the BEST VALUE in the industry! 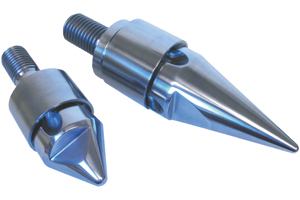 We stock a wide variety of brands, plus we also can manufacture any screw tip assembly. 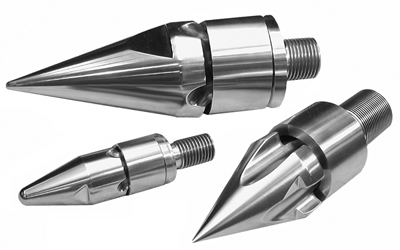 Using your sample tip assembly, your print or a print from our extensive library, we will manufacture a screw tip assembly to match your specific requirements. SFP screw tip assemblies are available in a wide variety of tool steels to match your application. The following brands of tip assemblies are in stock and ready to ship. If you don't see what you are looking for, please contact us at sales@servicesforplastics.com or phone us at 1-800-627-1033. We can make any screw tip assembly! No one check valve design is perfect for every application; therefore, we offer three distinct designs to ensure the proper component for your application. A good high strength pre-hardened tool steel which is machined, thru-hardened, and ground dimensionally, then nitride hardened for 72 hours for better wear resistance. H-13 is tough and can handle pressure and torque. A high carbon/high chrome tool steel with good wear resistance, but low on torque strength. D-2 should only be used with 4-piece designs where the stud is manufactured from 4140, H-13 or another high torque steel. Crucible's CPM®-420V is a new stainless tool steel best suited for corrosion resistant applications. CPM®-420V is a higher performance upgrade from CPM®-440V. Corrosion resistance is significantly better than CPM®-440V. Wear resistance is about 25-50% better than CPM®-440V, due to the higher Vanadium Carbide content of CPM®-420V (9% Vanadium vs. 5.5-6% in CPM®-440V). For price quotation and delivery - call us with the machine make and type of screw tip assembly you want. It's quick and convenient, so request a quote today!